What does it mean to do a program ‘on your own’ versus ‘as a group’? The content for each program is divided into days, so that you can complete the program in manageable chunks, and feel a sense of progress as you go along. We encourage you to add a comment as you complete each day’s assigned activity. We’ve found that ‘checking in’ like this helps you to stay motivated, to feel accountable, and to really enjoy the program. There are two ways you can complete the program. You can log in to your account, click on the program dashboard, head to Day #1 and get going as soon as you’re ready. Read the day’s content, complete the task, and leave your comment. We read the comments and are there to provide encouragement and support and answer questions. Then do the same on Day #2, Day #3, etc. You can also sign up to receive daily reminder emails from your program dashboard. Each year we announce a Program Schedule of dates. On these dates, people can complete the program on the same dates as others, as a group. This creates a fun feeling of support and community, as people share replies and support with one another in the comments. We also post reminders on Facebook and in our e-newsletter. How are the programs accessed? All our programs are available online. They can be accessed anytime and from anywhere with an internet connection, using your computer, smartphone, or tablet. When you purchase a program or become a Premium Subscriber you create an account with a username and password. You access each day’s content from the program dashboard, via your your MY ACCOUNT page, using your username and password. What if I don’t have Facebook? Facebook commenting allows us to provide support, encouragement, and answers to questions for participants in our programs. It provides a means of accountability, as well as a sense of community. Some participants who do not use Facebook generally have chosen to open a Facebook account to use with programs like ours. What if I made a purchase on the old store? You can still access your old account and materials. If you purchased any products or packs on the old store, you can access your old store account and downloads here. If you subscribed to the Design Your Life membership program, you can log in here. If you purchased a Pack on our old store in the last 12 months, then in line with our Customer Love Policy, we’ll upgrade you to Premium Subscription status. Depending on the Pack you purchased, you’ll receive Premium Subscription status for up to three years. If you purchased a Pack more than 12 months ago, then we’ll offer you a Premium Subscription discount. As a Premium Subscriber you receive every current product, as well as every new product released during your Premium Subscription membership. Simply contact Customer Support with your Pack order details. Many of our products are interactive PDFs, which means you can enter text, save, print, search, edit and re-use. This means you still have access until the end of your subscription period (eg if you had a Monthly subscription you will still have access until the end of your month) and then our system will automatically cancel your subscription payments and access (you will not be charged again after cancelling). If you have any questions or concerns after cancelling please contact our friendly Support team and we’ll sort it out for you. For some very old subscriptions the above process may not be available (eg some PayPal subscriptions created prior to December 2014 may not have the above option) – don’t worry, simply contact our friendly Support team and we’ll cancel this for you manually. For customers who have setup a subscription paying via PayPal, you can also cancel your Premium Subscription (and ensure there are no future charges) simply by logging in to PayPal and canceling it from your pre-approved payments screen. If you have any questions regarding your subscription, please contact our Helpdesk team. All our products are downloadable PDFs. You receive an email confirmation within minutes of your purchase. The email contains a link to your account page, from where you can instantly download your product to your Mac or PC. You don’t need any special software. To use our products we recommend you instal the latest version of the free Adobe Reader. You do not need a Paypal account. You can make your purchase using Paypal or a credit card. Paypal is our payment gateway, so payments are processed via the secure Paypal system. Do the products work on Macs? All our products are downloadable PDFs, which are easily viewed on PCs and Macs. Can I upgrade to a Premium Subscription? 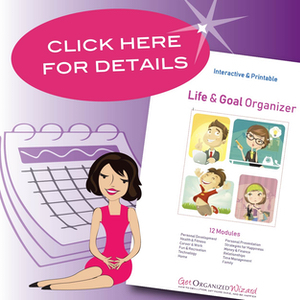 If you’ve previously made a purchase from Get Organized Wizard then you can upgrade to a Premium Subscription. Email [email protected] with your order details and we’ll provide you with an upgrade coupon. “Ok, so I started, I walked and filled. Suddenly I noticed, the bag was dragging and was bursting at the seams. Huh, ok another bag. Hey my 30 minutes is up, still I can’t stop now I’m just into the swing of things. So on and on and on. 4.5 hours later, 6 bags….and I haven’t even been into my garage yet. Hey this was a wonderful task, not only did I feel I uncluttered my home, I feel more room in my brain too.